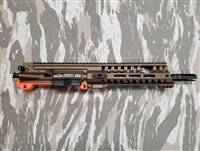 The New POF USA 300 Blackout (300 BLK) from Patriot Ordnance Factory. The POF USA P415 AR15 rifle is a fine piece of precision engineering and a real standout among semi-auto rifles available in the marketplace. They are not introducing there short stroke gas piston system and Direct Impingement chambered in 300 blackout! Ten years in development, seven patents granted and more pending, the P415 Gen 4 rifles are made stronger, operate smoother with less friction, have fewer moving parts, require less maintenance, and have greater reliability and accuracy than the competition. One AR-15 may look similar to all the others at first glance, but POF-USA is totally unique in their approach to gun manufacturing. As a result, POF USA P415 accuracy and reliability are highly regarded by the experts.